I'm looking to pin down what NPC sages can do for the PCs in my 5th edition game with a bit more clarity. Has anyone devised house rules or found useful rules/guidelines in third party supplements? Read Magic. The sage can use all spell scrolls, automatically identifies magical writing (including glyphs and sigils), and can read text without triggering any protective magic. Alchemist: The sage is proficient with alchemist’s tools, and can craft uncommon magic dusts and non-healing potions. Apothecary: The sage is proficient with an herbalism kit and has the Medicine skill (+7). Astronomer: The sage is proficient with navigator’s tools, and can never become lost. Cartographer: The sage is proficient with cartographer’s tools, and can craft magic maps*. Folklorist/Historian: The sage is unmodified. Linguist: The sage knows six additional languages. Natural Philsopher: The sage can identify the weakness of any beast, humanoid, giant, monstrosity, or plant. Occultist: The sage can identify the weakness of any aberration, celestial, dragon, elemental, fey, fiend, or undead. Professor: The sage bestows a creature one of its spells after 8 hours of instruction; the creature may then cast that spell once within the next 24 hours. Scribe: The sage can craft spell scrolls and spellbooks. Seer: The sage can cast augury as a ritual at will. Dagger. Melee Weapon Attack: +2 to hit, reach 5 ft., one target. Hit: 2 (1d4) piercing damage. 9th level spellcaster, but only 2 5th level spell slots and 5d8 HPs? Probably the least interesting aspect of the concept, but I understand how the numbers might make you curious. 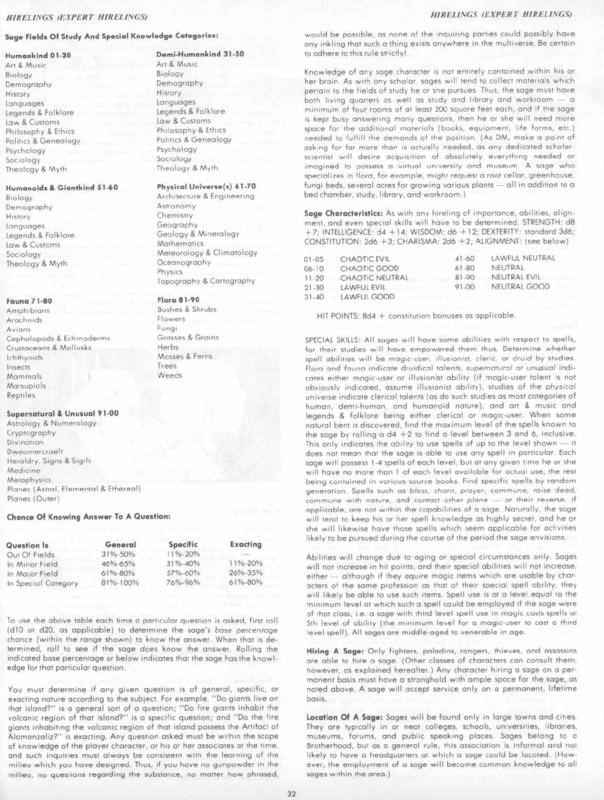 To start with, I was looking at the AD&D sage guidelines (see spoiler below), and later the Warlock NPC stats in Volo's Guide to Monsters. I wanted to create a NPC who could accompany the PCs (e.g. on a "protect the sage to the distant library" mission) without a great chance of being one-shotted by a monster... so with hit points comparable to a Druid (5d8+5) or Priest (5d8+5)... instead of a Commoner (1d8) or Noble (2d8). Certain spells model aspects of a sage's knowledge very well (e.g. identify is a great short-hand way to refer to a sage's ability to appraise magical relics of the past, whereas legend lore is a great way to model the sage recalling excerpts from cryptic texts). However, conceptually a sage shouldn't be throwing down a lot of magic all at once, but what they do know should be replicable fairly regularly (the sage can spout lore all day long)...and that made me think of warlock spellcasting. I knew that the 5th-level legend lore had to be available to the sage, for thematic reasons. Hence I drafted a 9th level spellcaster emulating a warlock, because 5th level spells are available once a spellcaster has 9th level spellcasting ability. Now, at that level a warlock would cast all spells using 5th level slots. While most of the spells I chose for the sage can't be upcast, the sage can cast dispel magic at 5th level. That's an important thematic consideration, because it means the sage can break spells like dominate person, geas, hallow, planar binding, scrying, teleportation circle, and a few others which have considerable narrative impacts. This opens up adventure scenarios where, for example, the PCs need to reach a sage who know how to break a fey geas cast on one of them, or need to consult a sage who knows the Celestial seals needed to break an unholy influence gripping ancient ruins. I was a bit concerned that being a 9th level spellcaster with 5d8 hit points might confuse a DM, but there is official precedent of these things not being the same with the Warlock of the Fiend (17th level spellcaster with 12d8+24 hit points), not to mention others like the Cult Fanatic (4th level spellcaster with 6d8+6 hit points). Moreover, it's well established in 5e that NPCs are not created with same rules as PCs. Last edited by Quickleaf; Thursday, 1st November, 2018 at 08:12 AM. @Quickleaf I like what you have done. Perhaps what might be needed is a Lesser and Greater NPC-types just for overall completeness. This would also be handy for a conversion of UK4 When a Star Falls. Thanks! If I yoink this, I'd drop the spellcasting completely and lower the hit die to 3. That is to say, I really like the Sage Specialty and the Read Magic bit is cool, and still lets the Sage cast any spell . . . if I give him the scroll. Dropping the actual spellcasting is just a personal preference, by the way. It's extraordinarily rare that an NPC is a spellcaster in my games. I am not sure why you need any specific rules for what a sage can do to be honest. To me, the question "Why are the players consulting a sage" provides me with all that is needed. A sage can just be any NPC that has the knowledge the PCs need to accomplish X. Unless you plan on the players getting into combat with the sage, there seems to be little point in creating a bunch of stats that will never be used. Not all sages should be spellcasters, despite the suggestion in the 1E DMG. Remember, in 1E all priests were clerics (or druids), because they didn't have a real concept of NPC classes (at least not official ones; the Dragon was full of them). Just like the Acolyte is now a background (as is the Sage), it shouldn't grant them class abilities. Sages are also specialists; by giving them a big bonus to all knowledge skills, you're making them generalists. A better method would be to give expertise to only their specialty, then add 1-2 secondary skills that have a normal bonus. Possibly give them advantage on certain specialized checks (e.g. a specialist on the planes would have advantage on the Arcana check that they have expertise in). Remember that you really shouldn't leave important information to chance. If you roll for the NPC, there's a chance of failure that might derail your adventure. 1. How about contact other plane? Actually, one good use of Specialties might be to expand the spell list. 2. What is a "magic map" and why is there an asterisk after it? 3. For some reason I feel icky giving a creature a higher spellcaster level than its hit dice. If it were up to me, I'd increase the hit dice to 9d8, and then lower the Constitution to 9 (-1), leaving the Sage with 31 hit points. 4. Natural Philosopher and Occultist seem to give benefits that most sages already have? Is identifying weaknesses supposed to be automatic for them or something? 5. I feel kinda sorry for the Folklorist/Historian since they get no goodies. Maybe they should get some sort of upgrade too. Maybe instead of making the Specialty part of the stat block, you could make it an optional thing in a sidebar (like the Swarm of Insects variants in the MM) -- so vanilla sages aren't a result of a random roll, they're a choice by the DM to not partake of the Specialty subsystem. Might be Off-Topic... contacting one of the sages?